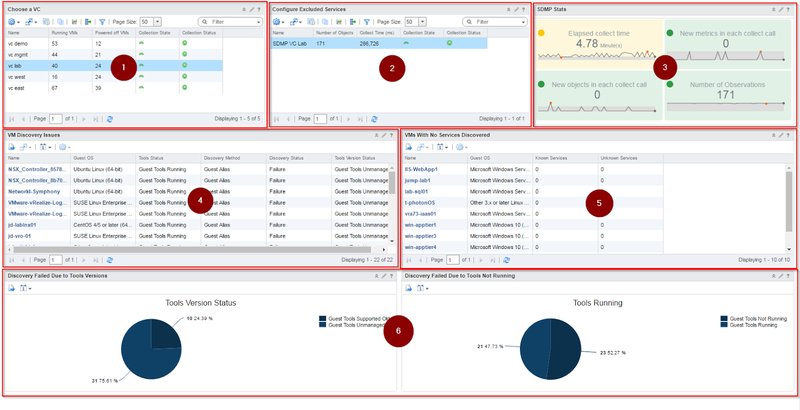 While working with the new vRealize Operations Service Discovery Management Pack in the Tech Marketing lab here at VMware, I built a dashboard to help troubleshoot service discovery issues. I am sharing this in case others find it helpful. This dashboard helps with isolating each of these problems; let me show you how. 1 - Select the vCenter you wish to troubleshoot. You can also view the collection state of the VC here before digging too deep. If there are problems with vCenter Server, you should address those first. 2 - This list provides all of the SDMP adapter instances; it makes it easy for you to configure excluded services for SDMP. 3 - SDMP Stats scoreboard shows some interesting stats based on the SDMP adapter instance selected in item 2. 5 - VMs with No Service Discovery is a list of VMs for you to work from that have no initial discovery. 6 - Tools Status breakdowns provides overall number of VMs with tools running/not running and tools versions installed. 2 - Extract the zip file to a suitable location. 3 - In vROps UI go to Content > Dashboards, import the SDMPTroubleshootingDashboard.json file. 5 - Finally, open the SDMPTroubleshooting.xml file in an editor (notepad is fine). Create a new metric config called SDMPScoreboard in Content > Manage Metric Config > ReskndMetric and paste the contents of the xml file into the new config (you should overwrite the default contents). Save it and you are finished! There is no Content option in 6.6. So for dashboards it is Dashboards, Actions, Manage, Gear / import. You dashboard is handy and yet does not explain why I see no identified apps, nor the options to ignore or identify. I think a nice widget for your dashboard is a list of recognized apps. Thanks for the 6.6 steps, and feedback. Just keep in mind that if you expose the widget tool bar (click the "eye") you can use the Actions option for registering and unregister in services (on the adapter instance list) and import credentials on the vCenter adapter instance list.